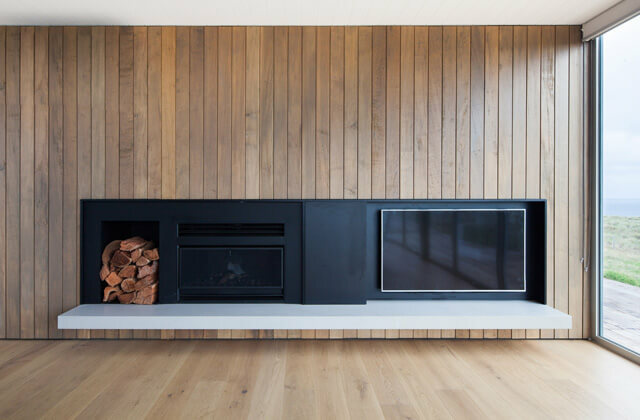 We may be about to hit a sweltering hot summer, but it’s important to not to forget the role the humble fireplace plays in your home design and function. Whether wood-burning or gas, your choice of fireplace can play a vital role in both the look and feel and efficiency of your home. After all, the hearth is often referred to as the center of the home. There are a multitude of fireplaces to choose from but to help you narrow down your search, here are our favourite fireplaces used frequently in our modular homes. When we consider beautiful, well-designed fireplaces, there is no going past Cheminees Philippe. 100% designed and manufactured in France but with a 100% Australian-owned branch – managed by Wignells in Melbourne – Cheminees Philippe makes elegant French design effortlessly accessible. Combining stunning and innovative aesthetics with efficient heating technologies, Cheminees Philippe is one of Europe’s leading fireplace manufacturers. Their range includes a variety of design and functional features to suit any commercial or residential building project. Available in a number of sizes and style, the range is divided into single-fronted, double-sided and triple-sided models – all of which promise a unique and sophisticated touch to any room. We employed a stand-alone, double-sided Cheminees Philippe in our Shoreham prefab project. The fireplace takes center stage and defines the living and dining areas without interrupting the space’s openness and minimalistic aesthetic. In terms of construction, Cheminees Philippe employs only the highest quality materials which include heavy-duty cast-iron for the fireboxes, ceramic glass for the doors and carefully considered heat transmission fans. These elements not only lend the fireplaces a timeless visual quality but also work to ensure maximum energy efficiency for more sustainable homes. The uniquely designed doors of Cheminees Philippe fireplaces enable two different experiences. The doors are retractable, sliding up to reveal an uninhibited view of the open fire. However, for a greater heat output, when the doors are closed they operate as efficient slow-combustion heaters, capable of heating between 180 and 350 square metres. This doesn’t impact on their visual effect though, with their ceramic glass doors fully showcasing the fire within. Furthermore, thanks to their securely designed fireboxes, they are safe when left unattended. Available in both gas and wood styles, Heatmaster fireplaces pair excellence in heating technology with a range of designs to suit varying interior decoration schemes. For anyone who enjoys the pleasures of curling up near a wood-burning fireplace, these fireplaces are for you. 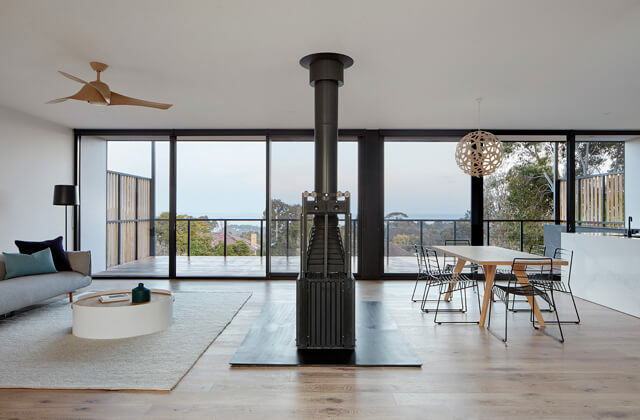 Heatmaster wood-burning fireplaces endow any room with warmth and ambience and are the only range of open fireplaces to receive an Australian Design Award. At Modscape, we love to include them in our modular design projects not only for their sleek designs but because of their flexible installation options. Thanks to a thoughtfully designed insulated shell, the A Series of wood-burning fireplaces can be directly installed into timber or plaster without any additional insulation or brickwork. This makes them far less costly and cumbersome to try and incorporate into a room and allows a much greater freedom for design. 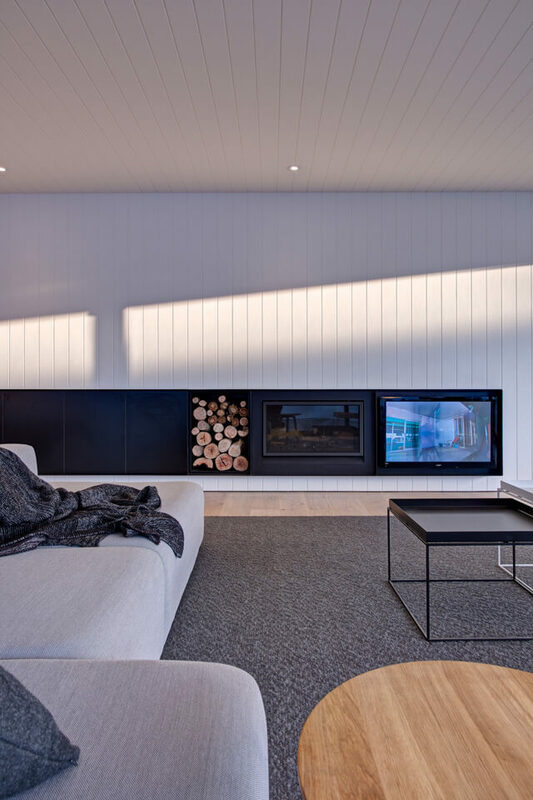 For example, in our Phillip Island modular home project, we were able to feature a Heatmaster open fireplace alongside the TV as a joint display unit. For spaces with already existing fireplaces, there is the Heatmaster B Series. In conjunction with the host of thoughtful design features mentioned above, Heatmeaster open fireplaces also carefully address functionality. Their 5-sided heat exchange systems allow for 8 times more heating efficiency than ordinary open fireplaces and feature a removable ash-tray for ease of cleaning and maintenance. For those who prefer a gas fireplace, Heatmaster’s gas range display excellent energy efficiency while heating at a capacity large enough to adequately service large, open-plan living areas. There’s even an option of ducting heat into a second room. A programmable thermostat provides easy control. In addition to their cache of operating features, Heatmaster gas fireplaces are designed with sleek, contemporary aesthetics in mind. There are three choices for the display – logs, pebbles or coal – and they can be finished in a variety of ways. Oblica said it eloquently when they wrote: “A fireplace should do more than just heat well. It should be the beautiful and efficient heart of any home, a functional piece of art.” This encapsulates Oblica’s practice: curating and distributing Europe’s finest fireplaces. Oblica carefully selects each fireplace based on both their heating efficiency and the uniqueness of their design. 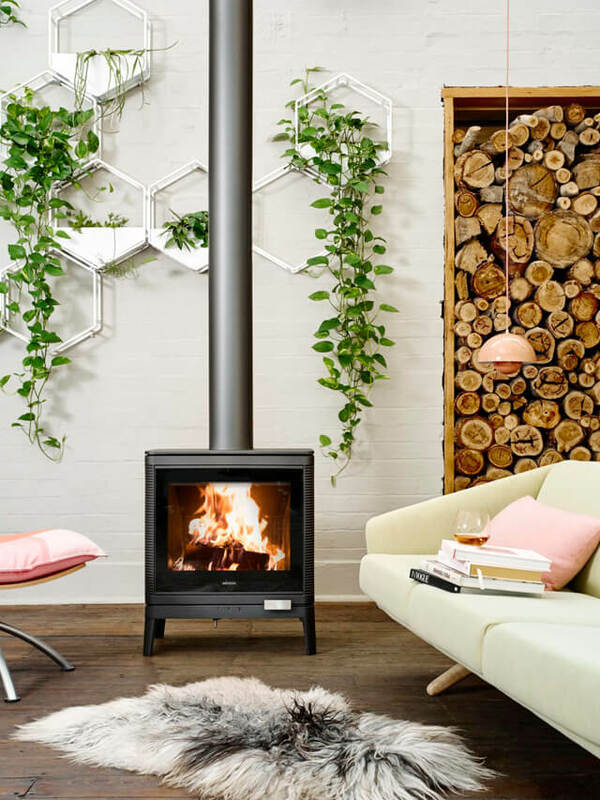 Featuring fireplaces from all around Europe, including France, Germany and Belgium, some of Oblica’s chosen brands include Focus, Snaktherm, Invicta, Stuv, Kemp, Devialet, LifeSpaceJourney, as well as their own range of fire accessories. At Modscape, we love Oblica for the innovative and breathtaking designs available with a range that offers freestanding, suspended and in-built options. 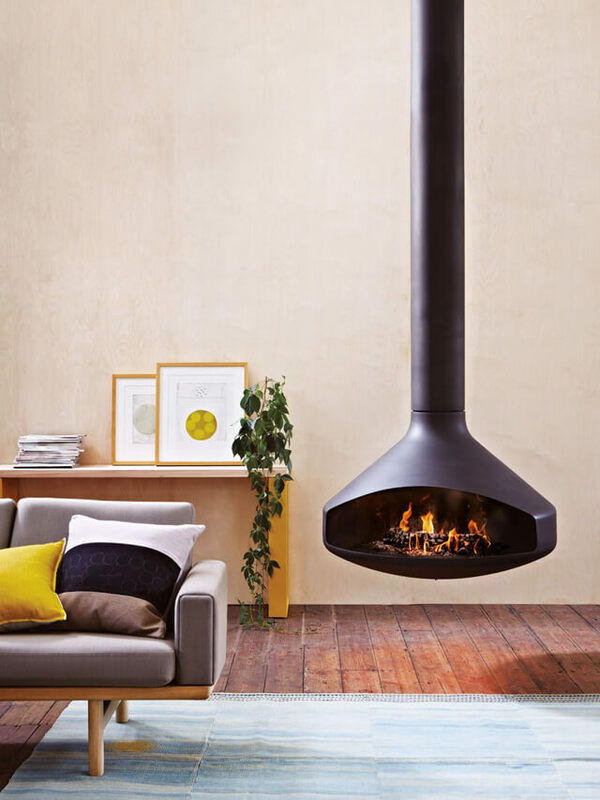 In particular, their suspended fireplaces are an extremely interesting and functional addition to any interior design project. Suspending a fireplace from a wall or ceiling is a great way to maximise space without compromising on design. Their striking designs and unique sculptural quality lead them to be the focal point of a room, or as Oblica would put it, the heart of a home. The majority are made of sleek, black steel and are available in spherical, oblong and cylindrical shapes, adding calming curves to a room. From Oblica, we’d also like to spotlight the French-made Kazan fireplace, which offers excellent value for money. 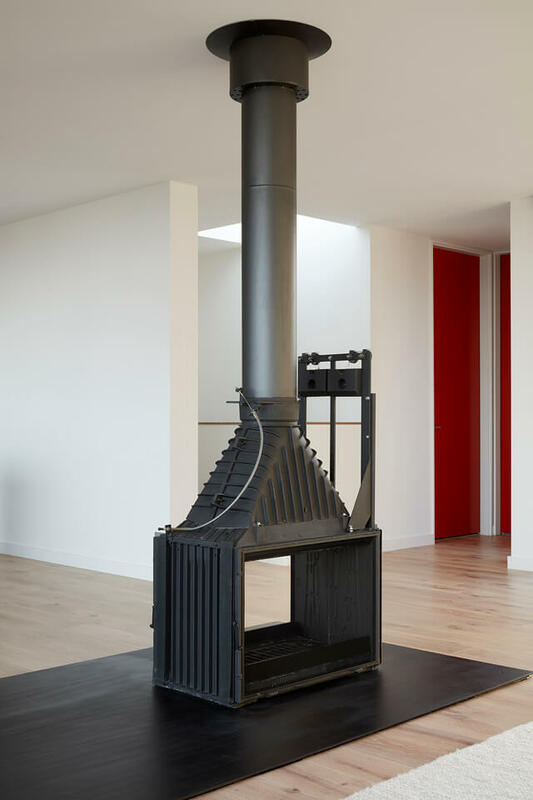 This freestanding, wood-burning fireplace takes inspiration from old cast-iron radiators and uses that same thermal efficiency in combination with contemporary design and performance. Using the slow-combustion system with a large heat exchange surface, Kazan promises to heat your home economically. We love Kazan for its affordability, great performance and compact, classic design.